FRUIT AND VEGGIE BLEND: A complete multivitamin that includes an Orchard Fruits and Garden Veggies Blend (150mg per serving). ALL OF THE GOOD. NONE OF THE BAD: Gluten free. Contains NO gelatin, artificial flavoring, dairy products, eggs, peanuts, preservatives, soy, wheat or yeast. DELICOUS TASTE: Not only great for you but also great tasting. 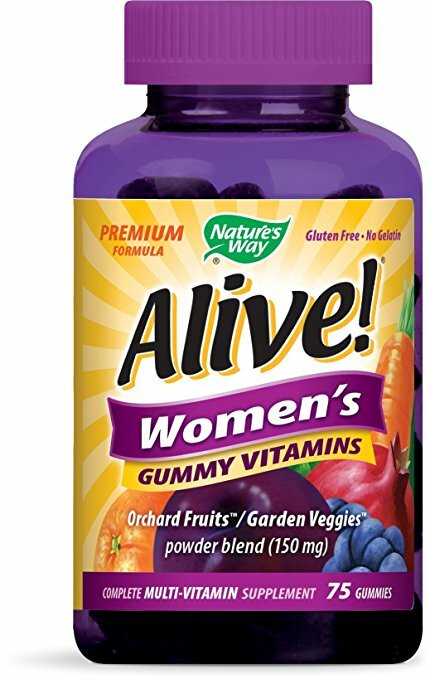 This Alive!® women’s gummy multivitamin comes in delicious fruit flavors, made from fruit-based pectin. SERVING SIZE: Chew 3 gummies daily, Includes a 25 day supply of gummy vitamins. *These statements have not been evaluated by the Food & Drug Administration. This product is not intended to diagnose, treat, cure or prevent any disease.